The coast is flat, the horizons wide and, on an empty island where once was just a small oasis, protected for 250 years by a fort built of coral and stone, the hot desert has been transformed into a small city of towers with a grid of streets rammed with cars. New buildings are smooth, faceless glass and the old, crumbling concrete not more than a few decades old, prematurely aged by the summer heat. Grandiose palaces and hotels face the blue Arabian Sea; lesser palaces and huge villas grace the western flank. 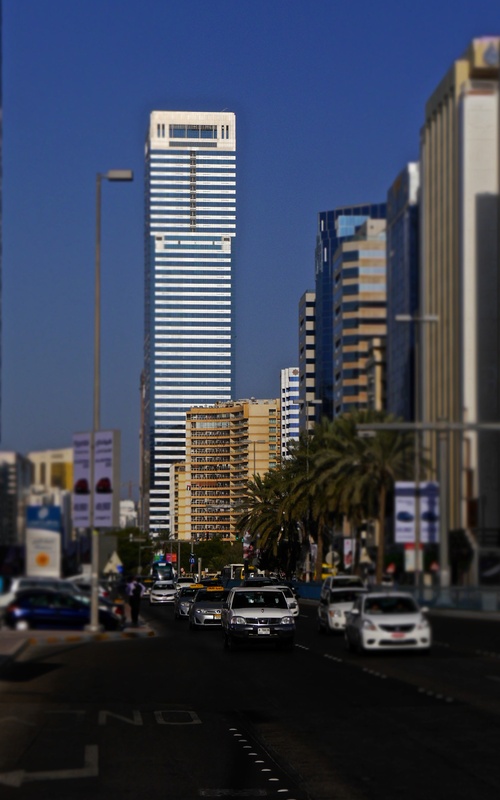 The tower blocks, stacked with workers, are concentrated along the coast behind the broad Corniche and down the eastern side, giving way after a few blocks to villas dotted with high rise hotels and offices. Three bridges stitch the island to the mainland and more hotels line the channel. Along coastal channels well away from the palaces and hotels are the power stations, desalination plants and sewage works. Together with factories, stores and labourers’ townships that huddle in grimy Musaffah and beyond, these tend the city as well as provision the other towns lost in the hinterland of the empty Emirate. 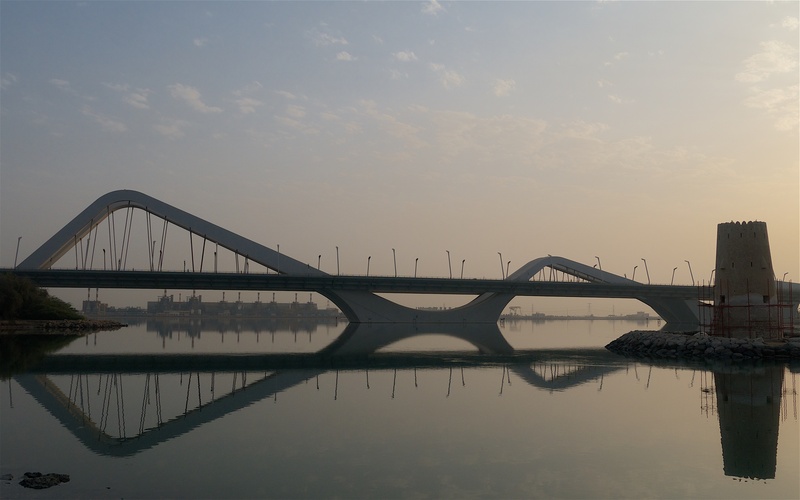 Zaha Hadid’s concrete waves: Sheikh Zayed Bridge is one of three bridges that connect the island of Abu Dhabi to the mainland. New towns in huge square blocks are laid out in the sands and sweeping palm-lined roads link all with confusing loops and underpasses. To the west of Abu Dhabi a vast and empty island is now hooked up by an enormous new suspension bridge. To the east, beyond the old port of Mina with its fish and vegetable markets, ugly cranes and huge storage areas, sits Saadiyat island with its posh museums, hotels and villas creating a new patch of luxury for the well-heeled on a rare stretch of coast that is natural and not man-made. New York University has a huge new campus in the desert behind and further down the six lane highway across mangroves and new housing estates lies the playground that is Yas Island. 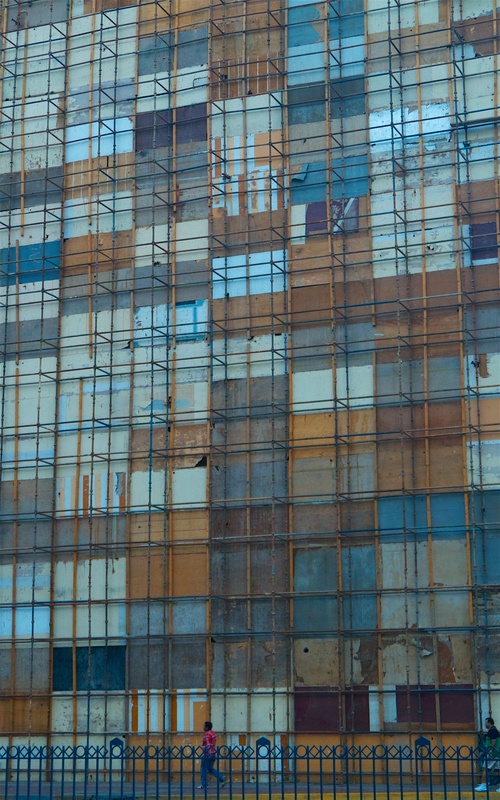 This might be an art installation in London, Paris or New York but in Abu Dhabi it is a shield made of plywood boards that protects the street from the demolition of the old tower block behind. The sea is hot, polluted and saline, more so where desalination plants pump back concentrated brine; land is reclaimed at will and the coral reefs shredded and smothered by dredgers. The land is sucked of its groundwater and pumped through a million miles of black plastic tubes to feed the green spaces and wide, tree-lined avenues. Architects design sky high hotels, towers, museums and municipal buildings with incredible geometry, some inspire others don’t; a patternless patchwork conceived and constructed in a generation. An idiosyncrasy built on sand. The Sheikh Zayed Grand Mosque is entirely comforting in its classic beauty and sits like a huge pearl within its misshapen oyster shell. This is a city of dreams or perhaps one of pulled and uneven teeth in an increasingly wide smile. 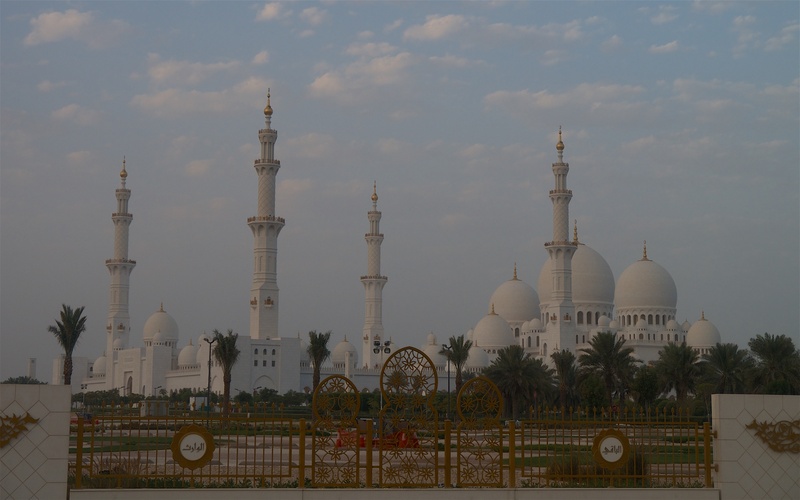 The Sheikh Zayed Grand Mosque in the cool of dawn. 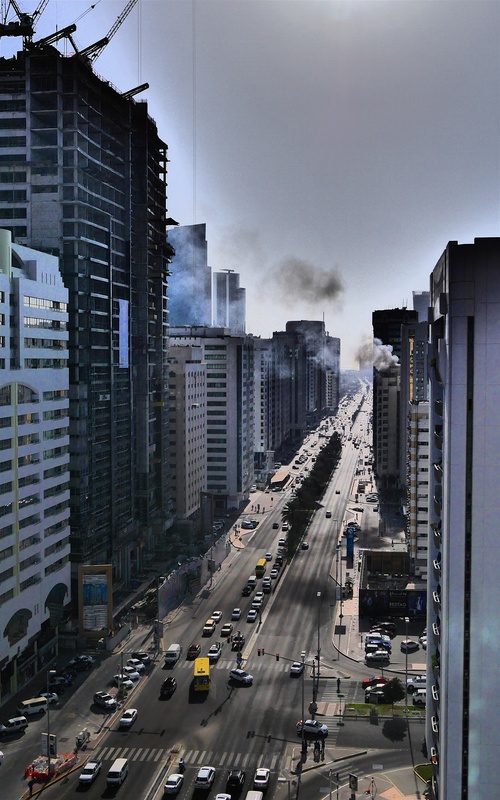 A small fire in an old tower block and the view to the Inter-Continental looking west down Khalidiya Street. The Bedouin tribes lived a harsh life for centuries moving between the the oases at Al Ain and Al Buraimi and fortified oasis of Qasr Al Hosn, now lost in the heart of Abu Dhabi, selling and trafficking slaves that were brought up from East Africa via Zanzibar, Yemen and Oman. The slaves fed the labour-intensive date and pearl industries. Britain turned its well-practiced blind eye after Wilberforce and the Slave Trade Act of 1807. Since the 1950s, they have made a much better return by pumping and selling oil. 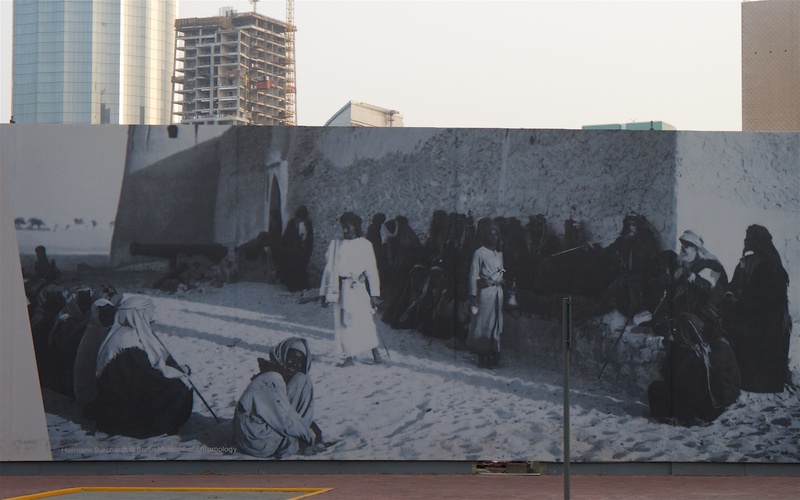 Part of a mural of old photographs erected around Qasr Al Hosn Fort as part of a festival to celebrate its 250th anniversary. 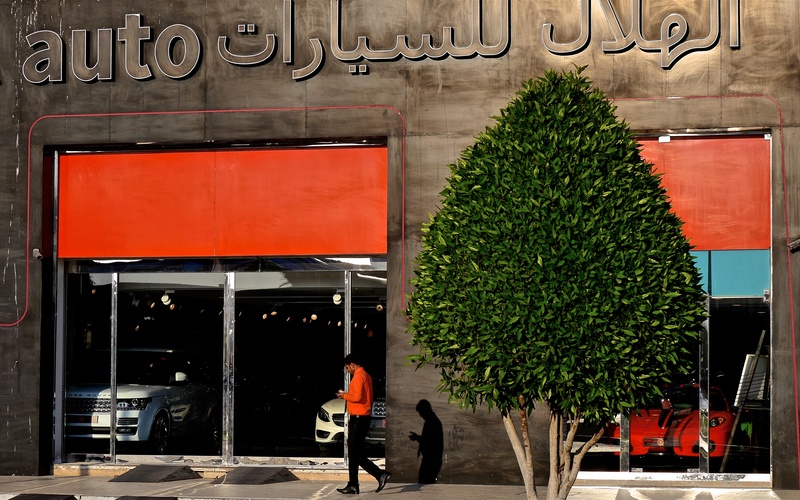 The Emiratis today occupy high-walled palaces and sumptuous villas, run ridiculous super-charged cars of all shapes and sizes, and are supported by households of servants including grey-uniformed nannies forever running after their charges. The drones of Western advisers and experts have fat salaries, super duper cars, sleek wives and well-schooled children. Northern Arabs also occupy positions of trust and authority and are equally plentiful. Many have settled here; Abu Dhabi is a haven compared to their war-ravaged or poorly governed countries of origin. The layer below are mostly Filipinos and South Asians, rich by the standards of Manila, Lahore, Mumbai and Dacca and many with flourishing families. 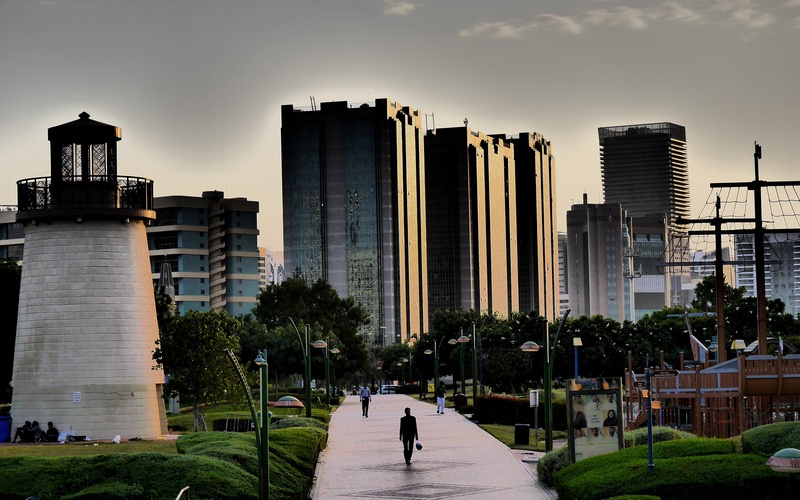 There are no retirement homes in Abu Dhabi; there is no permanent society beyond the Emiratis and their brothers. Nearly all foreigners apart from a handful of rootless old expats and Arabs return home to their castle and comfortable retirement. The lowest layers are single men working endless hours for a spit of money doing the menial jobs and forever phoning home to distant families. This is the underclass of automata. Shiny cars await their new owners. 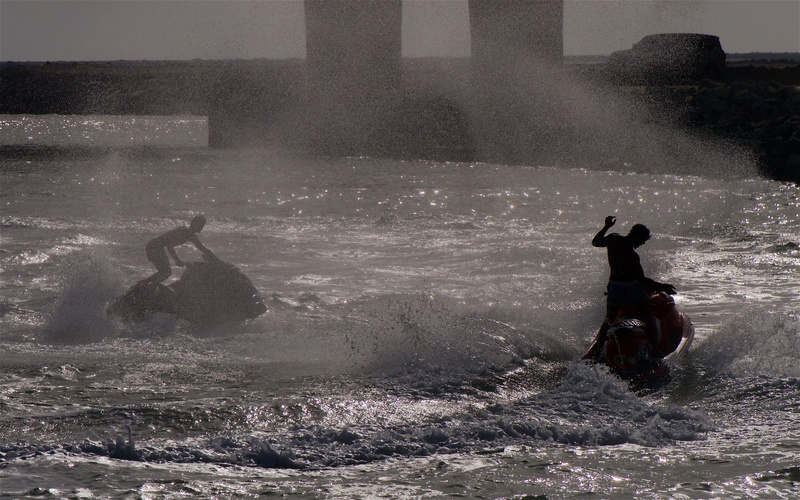 Many young Emiratis love jet-fuelled fun on the water; forever twisting the machines to splash each other and bouncing down channels at frightening speeds. There is no dissent but no free press, the rule of law is partial and the dynastic, autocratic empire driven by its strict, male-dominated religion creates a detached world, something akin to the declining years of the Roman empire. There is no res publica, no commonwealth, just a tribe of Bedouin trying to better itself after centuries of enduring poverty. The strange, hot world is like Newcomen’s great, old stationary steam engine; a perpetual nodding donkey, burning oil, money and people, powering an increasingly sprawling infrastructure and travelling nowhere. 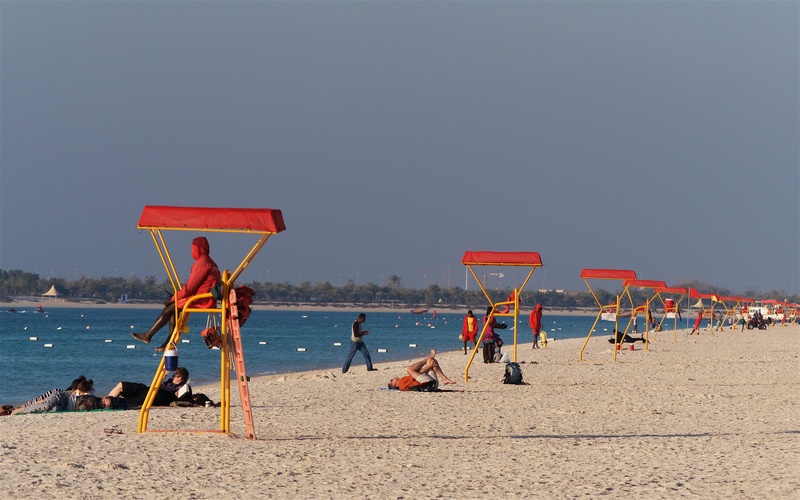 The new, artificial beach on the Corniche, marshalled by men who blow shrill whistles at dusk to clear the recalcitrant swimmers from the sea. And yet on a warm evening in winter, Arab families crowd the parks in neat circles of deck-chairs and the aromas of burning charcoal and kebab pervade the cool air as children play and quiet contentment flows across the wide lawns. The splashing waterfalls are lit by coloured lights. The traffic sounds are drowned and quotidian troubles distanced by the bubbles of shisha. Parks are verdant and full of families with barbecues through the cooler months. There is no crime and no racial tension because all are here by choice and the segregation is planned and overt. Everybody suffers the divine comedy of the byzantine bureaucracy. Everybody relaxes on a Friday but only those strong enough carry off the wine, whisky and beer in thick black, plastic bags from the discrete shops that pepper the city. The shopping malls provide coffee, society and dilettante commerce for all; in the suffocating summer they are packed, providing the only places for people to walk and children to play. Westerners party at the weekend and golf balls fly from dawn to dusk. Filipinos play their skilful basketball most evenings. On their day off on Friday, the single young men from South Asia play cricket on empty car parks and meander in small groups as they kill the day on the Corniche; they constantly photograph each other and send images of smart, serious men of consequence home via the ether and money via Western Transfer to their families, many of whom live in desperate poverty. There is much life and soul that lubricates the machine. Corniche men at rest on a Friday. We spent three years in Abu Dhabi (January 2012 – December 2014) and ventured into the desert, along the coast and up into the cooler mountains. Some of our best explorations were in neighbouring Oman often accessed via the quiet, oasis city of Al Ain. So there will follow, inshallah, a range of occasional stories with descriptions and photographs of places, people and wildlife from this corner of the Arabian Peninsula. 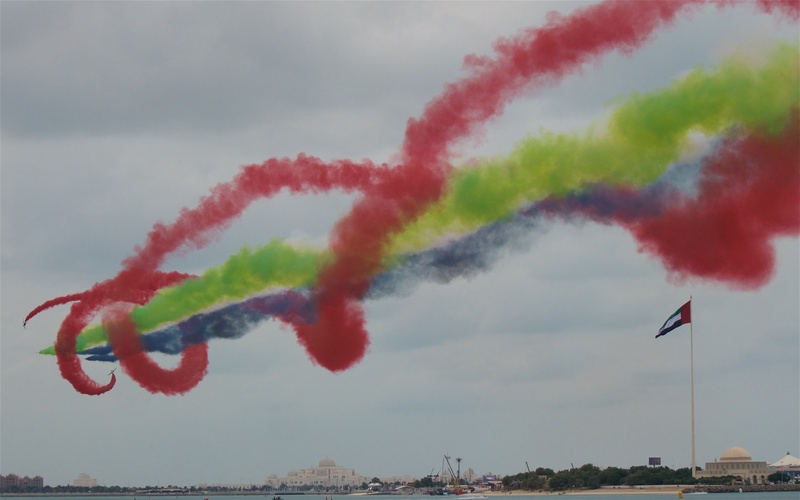 Under grey skys on National Day in December, a display of flying skills by the air force as seen from the Corniche with Palaces, National Library and huge United Arab Emirates flag beyond.